Docent led tours for the historic Sun House are Wednesday-Sunday, noon to 3 pm. 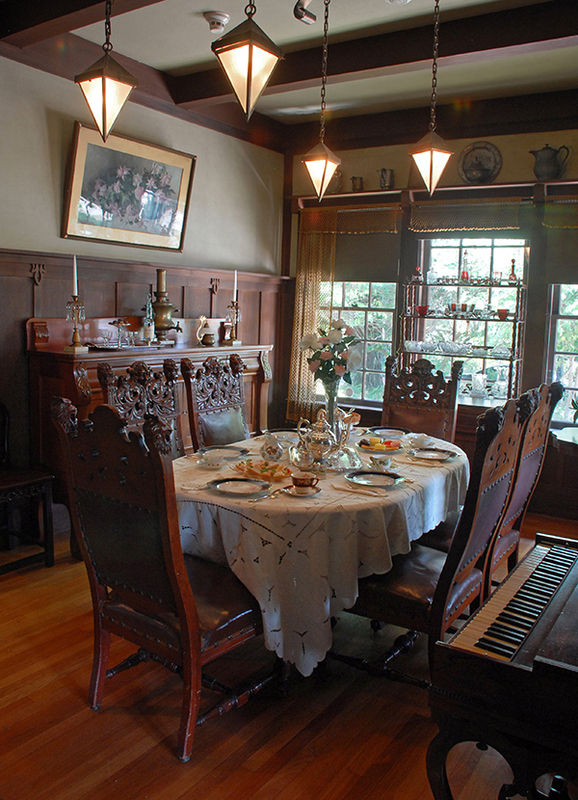 The Sun House, a 1911 redwood Craftsman bungalow home, is situated immediately in front of the Museum and is available for tours. Grace and John Hudson, its owners, together with architect George Wilcox, set out to build a functional, custom Craftsman-style home scaled to the Hudsons’ needs. Fairly modest in size, it nonetheless accommodated Grace’s prodigious artistic output and John’s sizeable ethnographic collections. Keeping in mind the Arts and Crafts goal of uniting designer and craftsperson, the Hudsons actively collaborated with Wilcox on the design of the house, while adding their own creative touches. These include the pink tulips that Grace stenciled on the bedroom walls, the distinctive hat rack built by John Hudson in the entryway, and the unusual pendant lighting fixtures throughout the home. As was often the case in Craftsman dwellings, the architect became the furniture maker as well, when Wilcox designed and built the beautiful sideboard in the dining room that he presented to the Hudsons as a housewarming present. It is believed they moved into the Sun House around New Year’s Day, 1912. While these personal touches make the Sun House unique (in keeping with the Arts and Crafts spirit), it also features many typical Craftsman details. The sloping gabled roof with overhang, the sleeping porch, the use of natural redwood and stone, the front veranda, board-and-batten walls, built-in cabinetry and window seats, curio shelves above the doorways, “honest” materials (such as burlap and monks cloth wall coverings), exposed timbers, and the home’s overall sense of simplicity, are all classic Craftsman elements. Though George Wilcox designed several other Craftsman homes in Ukiah, and a scattering of other Craftsman bungalows exist in the town, the Sun House remains its most famous example. This is in good part due, of course, to its distinctive inhabitants. Taken together, the Hudsons and the Sun House are the embodiment of Arts and Crafts ideals, and leave a local legacy of an international movement. The Sun House is proud to be a member of the Historic Artists’ Homes & Studios program.